Virgin Games, as the red colour scheme and signature branding will tell you, are part of Richard Branson’s endless Virgin empire. In actual fact though, the logo and name are used under license and the site is operated by Nozee Limited, a Gibraltan company. Virgin Games are licensed and regulated by the Gibraltar Gambling Commission, although the site is operated via offices in the UK as well as Gibraltar. 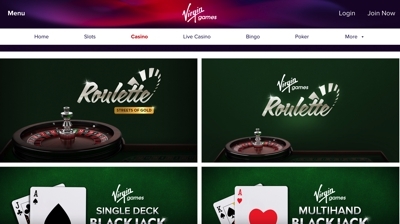 Virgin Games has been going since 2004, with Nozee a subsidiary of Gamesys Ltd, the software and gaming giant responsible for such industry giants as Jackpot Joy and Sun Bingo. Gamesys acquired Virgin in January 2013 and their wealth of knowledge and industry know-how can only improve what was already a polished and accomplished gaming experience. Of course, the Virgin brand was highly reputable and financially secure prior to the takeover but with Gamesys handling over £4bn of bets in 2012, you can be sure playing at Virgin is even safer now. Virgin Games offers a casino, which is easy and simple to join with straightforward and fun places to play. There is also a dedicated slots lounge, with all games being powered by Gamesys’ own software, rather than one of the big providers such as Microgaming. The customer service offered by Virgin is exceptional, with 24/7 live chat and a Freephone (UK) telephone option, as well as an excellent interactive FAQ section and an online contact form for non-urgent enquiries. In tests the operatives were all excellent, with short wait times and good, clear responses on a range of questions. Throughout the years Virgin Games has won a variety of industry awards and although the move to Gamesys has reduced the number of games they offer, we expect overall the benefits of the innovative technology Gamesys provide will overshadow any negatives. Virgin are popular with players and with Gamesys experts in social gaming we wouldn’t be surprised to Virgin develop more in that field and they are certainly one of the better casino operators around. As part of the Gamesys network, Virgin games offer a decent range of casino games to choose from. There are about 50 slots on offer from Virgin, which isn’t the largest number by any means. That being said, they do offer a decent offering of slots and the games are particularly well designed and thought through. On top of that you get a good range of table based games such as blackjack, roulette, video poker and more. The site also pushes their V Points, which allow you to earn cash rewards as you put in more hours at the tables.